This book hooked me in from the start! Even if I hadn't known anything about it I would have been sucked in right from the start. The opening scene reminded me of an episode of Spaced, if you've seen it then you will know what I mean when you read this book! Kim's voice is really natural and friendly and full of humour. there is a spark to her words that is very enjoyable to read, with plenty of laugh out loud one-liners. This off-sets the more serious notes in the book really well. She struck a good balance between action and humour here. I loved the premise of the story too. Scott is a "Shifter", and as such he has the power to undo any decision he's ever made. Sounds cool right? Hmmm think again! It soon becomes clear that with this great power, as always, comes great responsibility and not just for himself. Scott's world soon spins out of control. "In a world where anything can change with a single though, Scott has to decide exactly where he stands." The journey that Scott takes from that awkward and geeky teen, into a confident, capable master of his own world was thrilling to follow. I cant wait to see where his storyline takes him. He is compellingly written. You want to follow him and to know what he's thinking. There is such a sense of realism to this book that I think is down to two things. The first is the way that Kim has treated the plot. The idea of Shifting has the potential to make the plot rather complicated and difficult to follow. Not here however. Kim handled the possible complexity with ease. I was never lost or confused and was always able to follow the story and understand what was happening and why. The second is the setting. With it being set in London, it was easy to imagine. I'm so used to books being set in America or in a 'small town' somewhere that its nice to be able to relate what is happening to a place that I know and love. I think that my favourite character was Jake, the 'plucky sidekick'! lol he was entertaining and made me laugh more that once! It will be interesting to see where his storyline takes him in the next book too. I'm not going to giveaway anything else! You will have to get hold of a copy in September when it is released (in 31 days!!) and read it yourself! I thoroughly recommend it!! 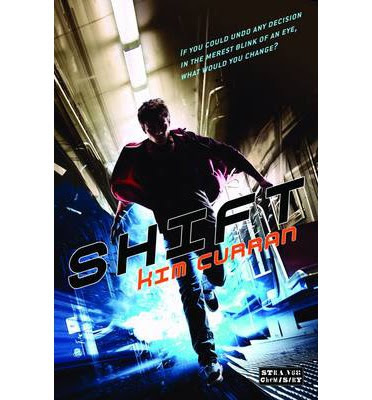 Have you read Shift? If you have then leave a comment to let us know what you think. If you haven't leave a comment anyway!